DENVER -- Social media speculation was sky high over the weekend after a line of flashing lights was seen above across the Denver area. At first glance, many saw a convoy of flashing lights lined up in a straight formation. 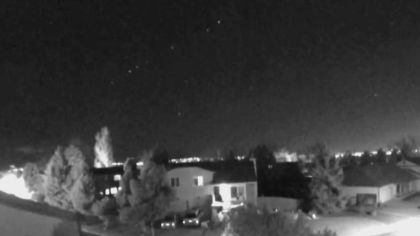 On Twitter, some speculated the line of lights were part of UFOs. Others were curious if they were drones. According to a military spokesperson, the lights actually belonged to a convoy of C-17 aircraft that were involved in an exercise. CBS Denver was told the planes were headed from South Carolina to Nevada and back. Aviation expert Steve Cowell says the planes were flying in a formation that is commonly seen in military exercises. "That was the echelon formation. In other words, they were all lined up in a row," Cowell said. "It is not uncommon to have these types of planes in formation, especially at night. Often times, you will see them doing this, especially when they are doing training flights, or standard cross country procedure." Some described the line of lights in the sky as "creepy," claiming they couldn't hear any sounds coming from more than a dozen aircraft. Cowell said the planes, being military cargo aircraft, are designed to operate at quiet tones. "(C-17s) have been modified to be just a little quieter. They are also flying a little slower. At that kind of power, you are not going to hear a lot of noise," Cowell said. While it may have been fun to speculate the possibility of extraterrestrial life making its way to Earth, Cowell said the lights in the sky over Denver were not extremely rare. "Don't assume it is a UFO. Not until the bulletin comes over the news," Cowell said. According to a military spokesperson, the planes returned to their base in South Carolina on Sunday morning.